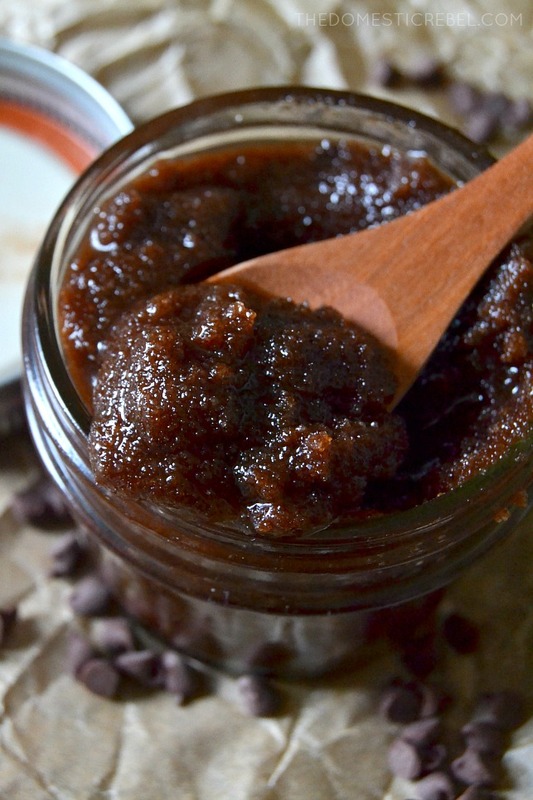 This Homemade Chocolate Sugar Scrub is perfect for gift-giving to friends, family, coworkers, neighbors, or yourself! 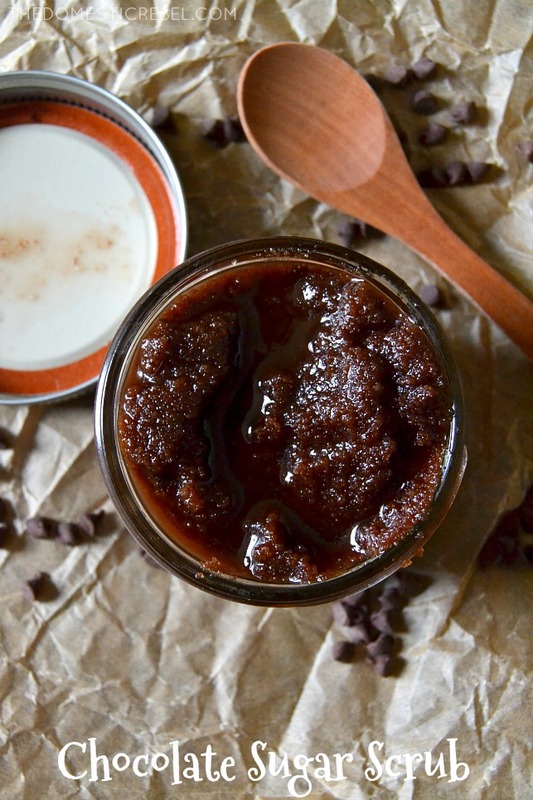 Indulge in this rich and pampering sugar scrub which softens and nourishes skin and makes you smell AMAZING! So as you know, back in September I took an Alaskan cruise with Princess Cruises. We sailed on their GORGEOUS art deco-inspired Ruby Princess ship from Seattle to Juneau, AK; Skagway, AK; Ketchikan, AK; and Victoria, B.C. Canada. It was a week full of adventure, new experiences, and lots of chocolate. Why chocolate? Because Princess teamed up with a master chocolatier named Norman Love, and it pretty much rocked my socks off. Once I found out about this Chocolate Journeys experience, I was determined to find as much of the stuff as possible. I was like a truffle pig, sniffing out the latest and greatest creations from Norman Love except with chocolate instead of truffles, obviously. And I did it in the name of journalism so I could relay exactly how to get the most chocolate out of your cruising experience with Princess! The Ruby Princess has a restaurant from famed celebrity chef Curtis Stone called SHARE by Curtis Stone. After five incredible courses, our lovely waiter presented us with our dessert. Mine? 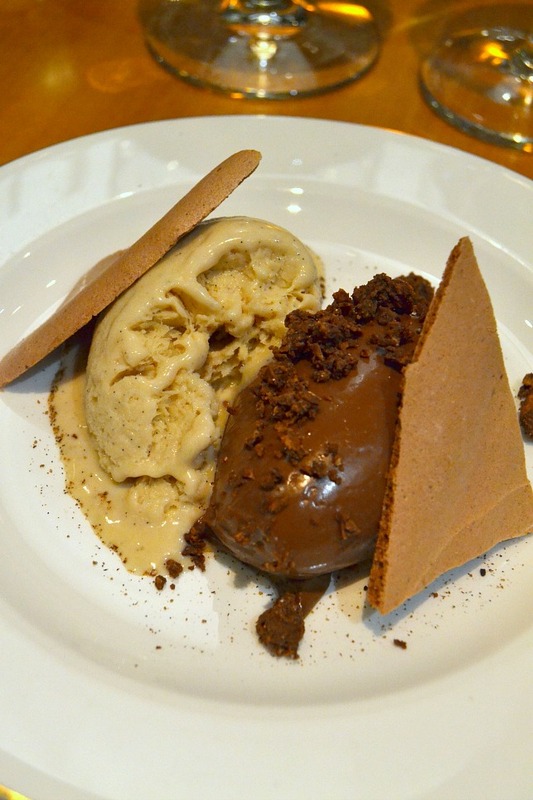 A Dark Chocolate Cremeux: chocolate hazelnut custard with crispy mousse and a burnt vanilla ice cream. In a word, it was FABULOUS. I’m definitely going to try to recreate this! Rich, sumptous Nutella custard with a lighter-than-air whipped texture paired with that burnt vanilla ice cream – a total dream. I MUST recreate the ice cream – it reminded me of toasted marshmallows, just blistered sugar on top of a creme brulee. Fabulous. While on board, you must take a wine tasting and blending class at the Salty Dog Gastropub. 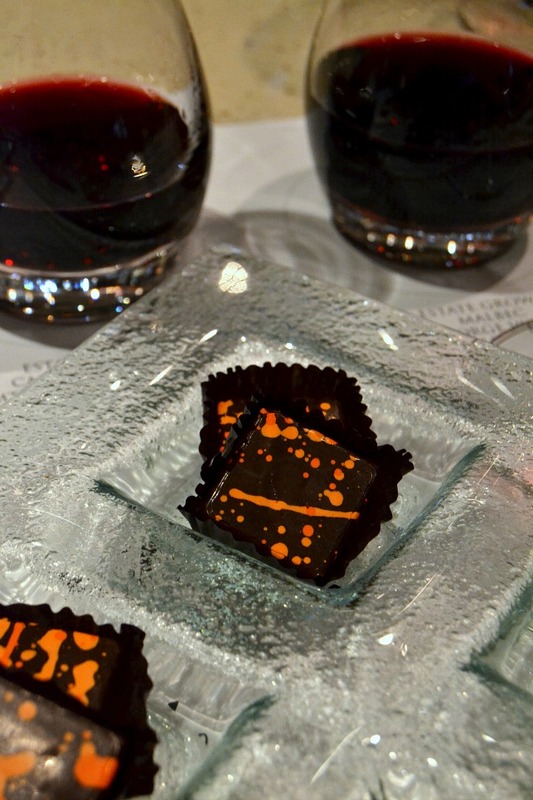 There, you’ll sample four different reds from Silverado Vineyards and blend your own tasty concoction while sampling artisenal chocolates from Norman Love. These little squares of dark chocolate practically melted in my mouth and paired beautifully with the fruity reds from the Napa Valley. 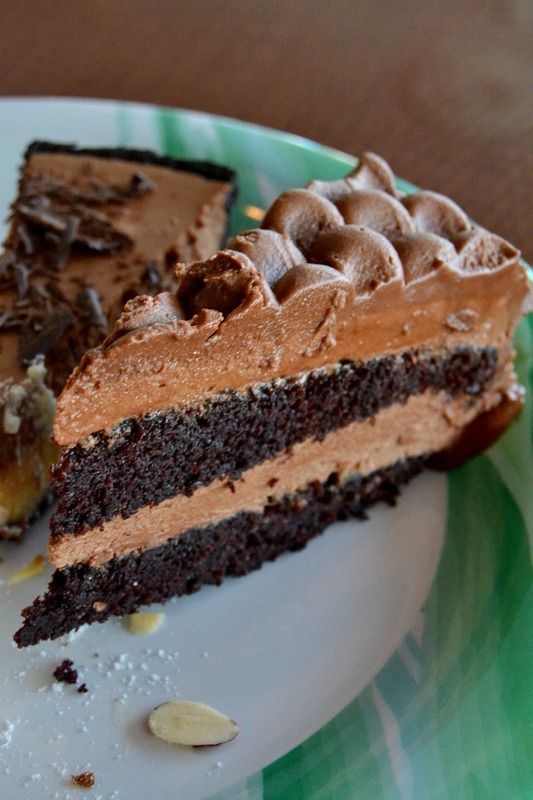 In the Horizon Court Cafe, this two-layer chocolate cake was a much-needed pick me up during a sea day. Moist, fluffy chocolate cake layers with a creamy, sinful chocolate frosting. I am definitely going to make this at home! 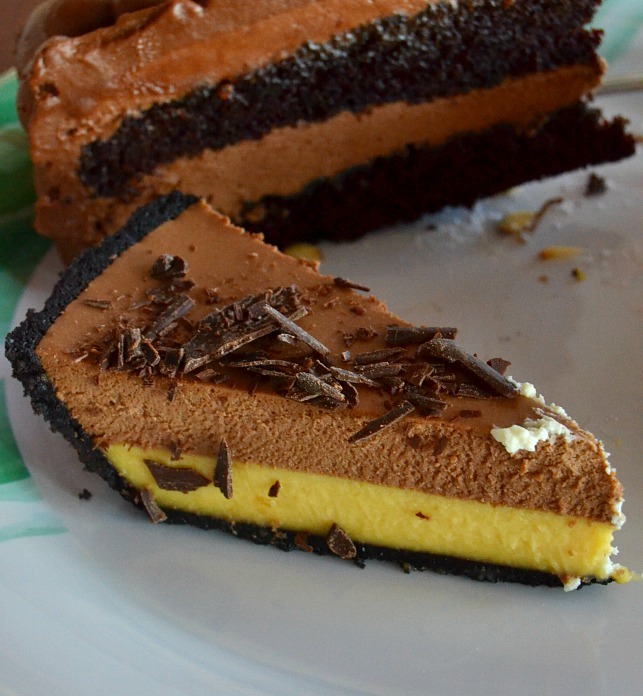 And for chocolate and peanut butter lovers, this Chocolate Peanut Butter Tart was a must! 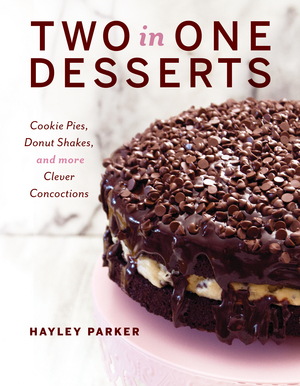 Also at the Horizon Court, it had a creamy peanut butter mousse layered with a smooth chocolate mousse, chocolate shavings, and a chocolate cookie crust. Outrageously good! 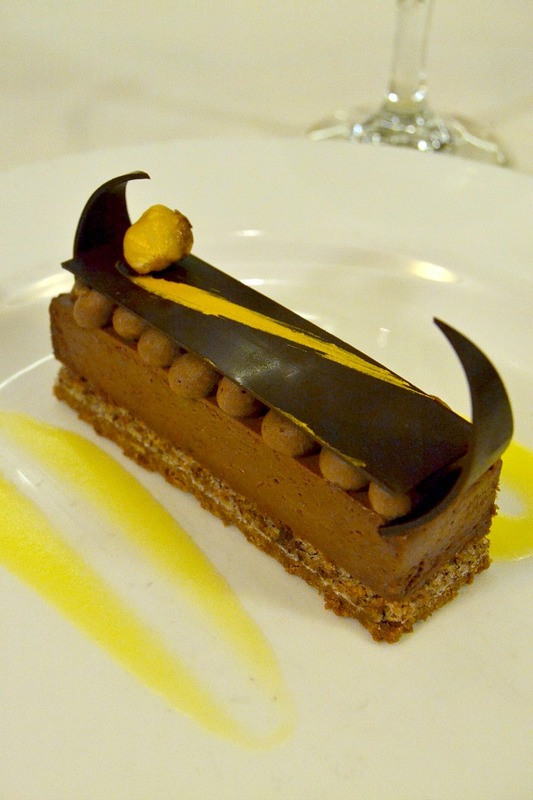 In the Michelangelo Dining Room one night, I sampled this Norman Love creation: a chocolate hazelnut bar with citrus cream. 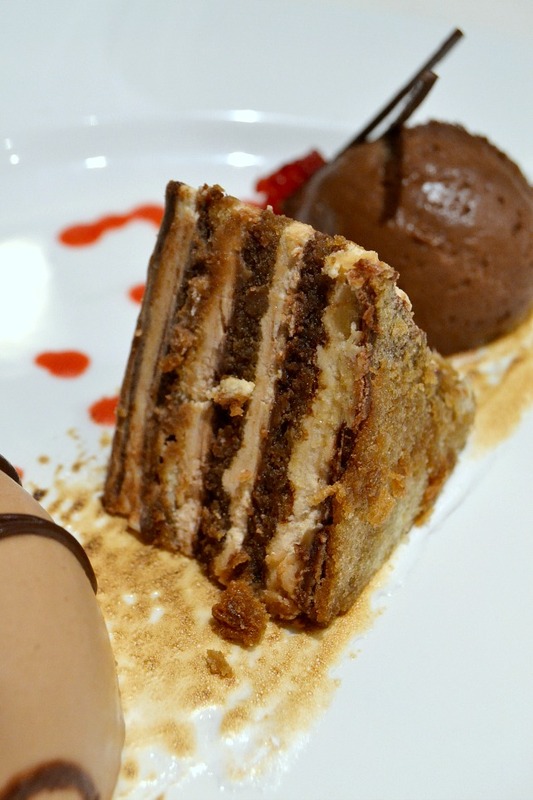 It featured a crispy wafer bottom with a luscious chocolate hazelnut mousse filling and a piece of dark chocolate on top with a bright, zesty citrus cream. 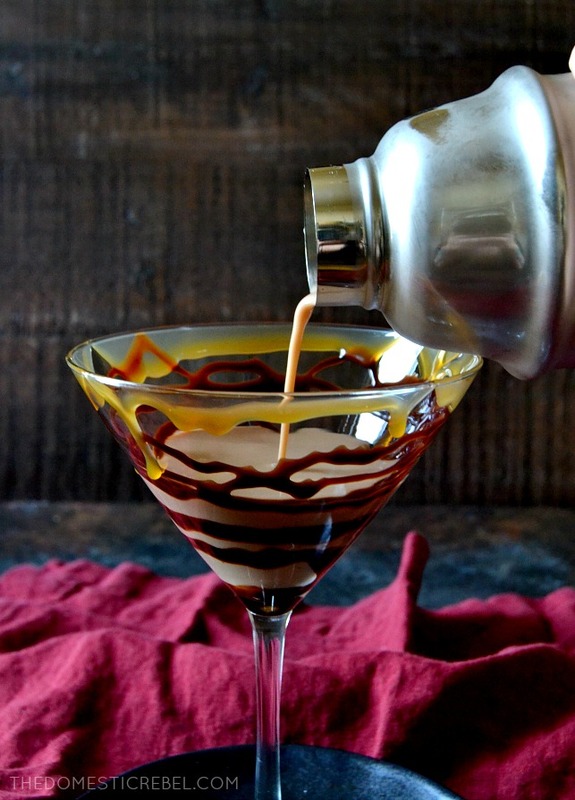 It was phenomenal – I loved the pairing of the tart fruit reduction with the nuttiness of the chocolate hazelnut bar. 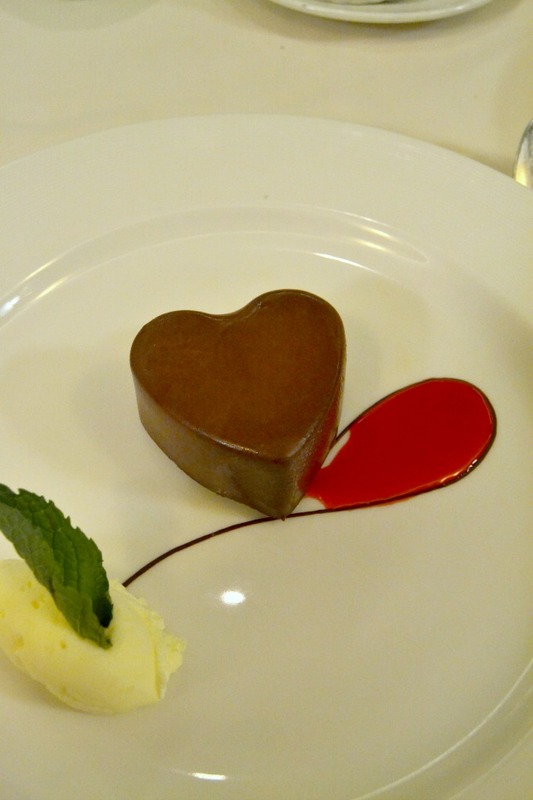 Michelangelo Dining Room also had this adorable heart-shaped mousse brownie with raspberry coulis. Perfect for date night! In the Botticelli Dining Room one evening, I had this Trio of Chocolate Desserts. All were perfectly portioned and so delicious. The center here was a miniature chocolate cake slice that reminded me of tiramisu – flanked by a chocolate mousse and dark chocolate & raspberry gelato. But my absolute *favorite* chocolate experience on the ship? The chocolate massage at the famed Lotus Spa. I know what you’re thinking: what in the world is a chocolate massage and how do I get one? I did it in the name of science and I have to say, I’m hooked forever. Arriving in the Lotus Spa, the staff will whisk you away to a quiet waiting area which offers fresh iced lemon water before your service. 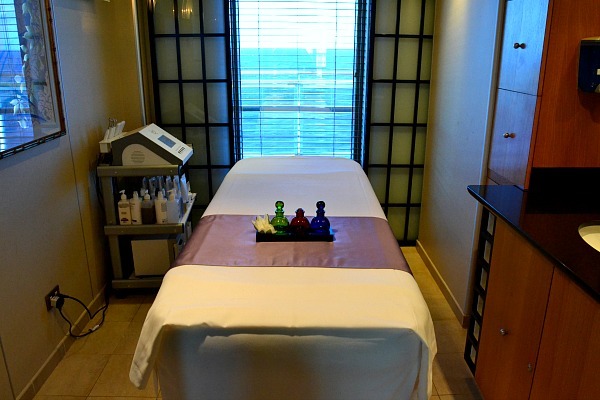 Get comfy in their plush robes and slippers before your massage therapist takes you back into the private room. 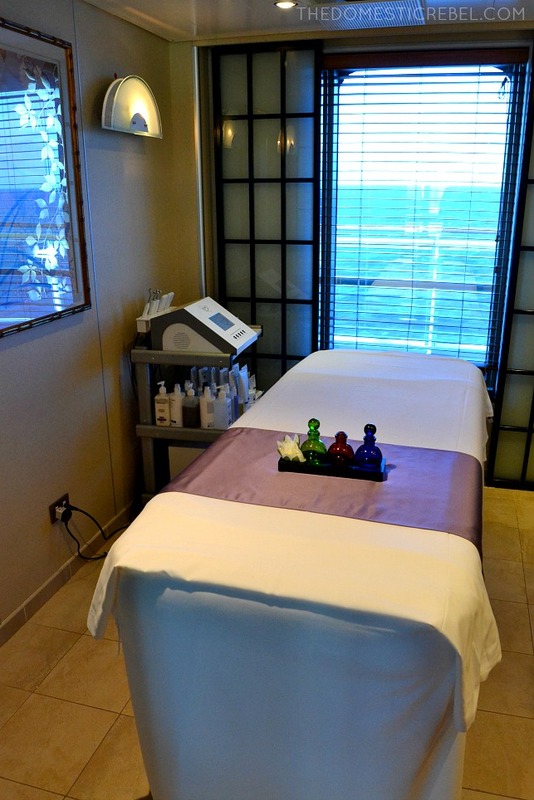 The soft massage table feels more like a cushiony bed, and the gently rocking of the ship encourages a deep relaxation. But the best part is when they start applying the chocolate all over your body. 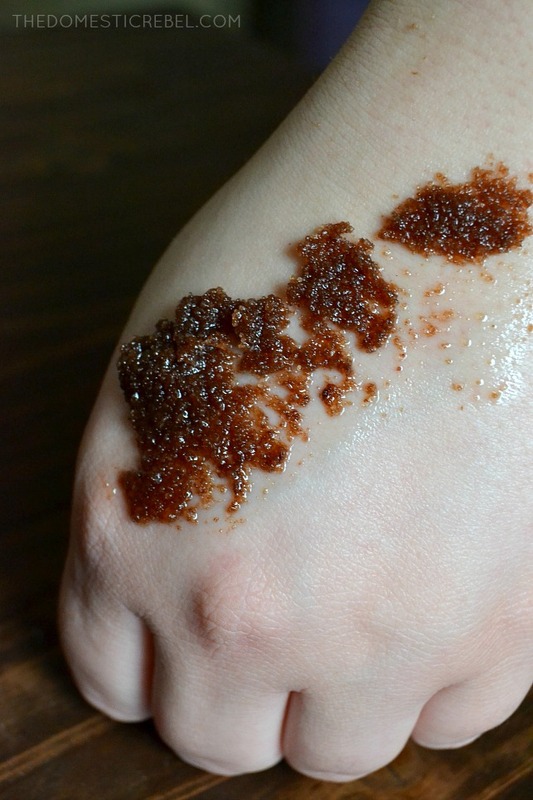 They first start with a chocolate sugar scrub which is grainy in texture but feels amazing as it sloughs and exfoliates. After you’re exfoliated head to toe, you’ll shower off and hop back on the table for a whipped chocolate mousse wrap. 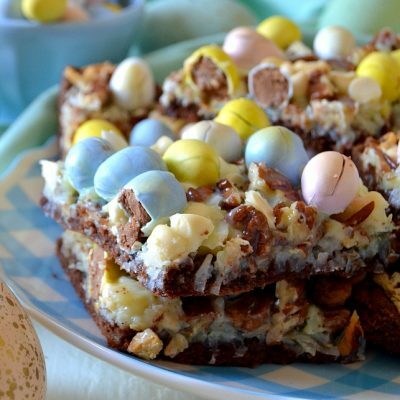 It has the light and fluffy texture of mousse without being cold or jarring – it seriously smooths on as if you were the cake and someone was icing you! Rinse it off, and then prepare for the best part: the chocolate body oil massage. As your therapist kneads your sore muscles, the aroma instantly greets you: smooth, velvety, rich chocolate with hints of coffee and vanilla. 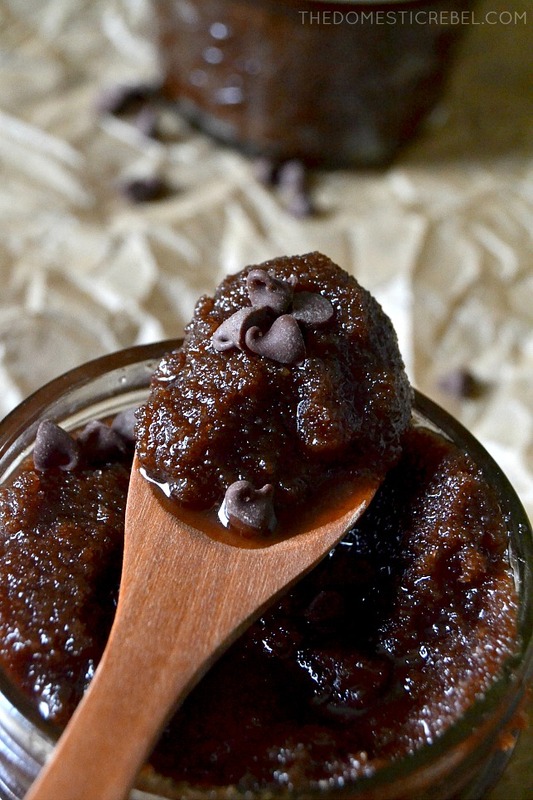 It smells like a warm bowl of chocolate cobbler: gooey, scrumptious, luxurious, tantalizing! 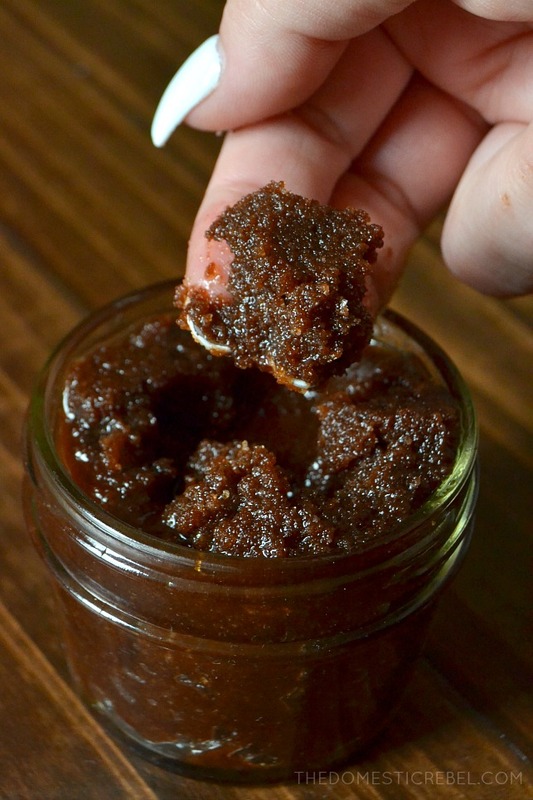 You can totally make big batches of this scrub for holiday gifts! Just spoon the sugar scrub into little jars, attach a bow and ribbon, and gift away! Everyone will thank you when they step out of the shower smelling like a melty chocolate bar! 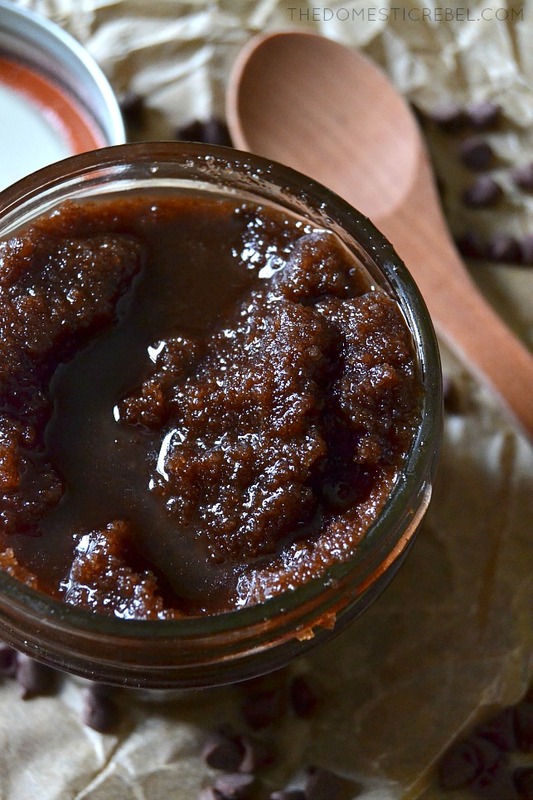 This Chocolate Sugar Scrub is an excellent gift idea for the serious chocoholics in your life! Only a few simple ingredients, it comes together instantly for an exfoliating, relaxing and pampering treat that smells just like a decadent dessert! NOTE: if you want to lend this a different scent, you may use a few drops of essential oils. Think orange, peppermint, or vanilla absolute. In a medium bowl, whisk together the sugars, vanilla, and cocoa powder until finely mixed and no clumps remain. Gently fold in the almond oil (or another oil choice) until a thick, glossy paste forms. Spoon into jars, seal tight, and gift, or use right away! TO USE: Lightly wet skin. Apply a generous amount to wet skin, rubbing in circular motions to exfoliate. Let sit for a few minutes before rinsing off. Lightly towel dry so as not to remove the oils from your skin. Do not use on face. Contact your dermatologist before using any new product and test on an inconspicuous, small area before applying to your whole body. If irritation occurs, please stop using the product. SUGAR SCRUB will keep for up to 2 months sealed. Have a super sweet day, and for more information on Princess Cruises, check out the Ruby Princess page, find out about Norman Love’s Chocolate Journeys, and be sure to check out their Lotus Spa next time you’re on-board! In the interest of full disclosure, I am working with Princess Cruises as a brand ambassador this year. I was compensated for this post, but all opinions are 100% my own. Thank you for supporting the brands that keep my blog alive! 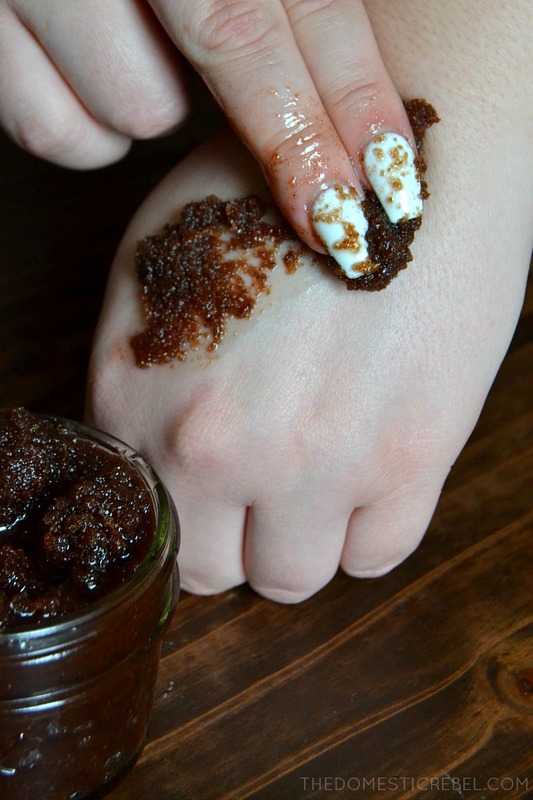 Sounds like an amazing experience and this chocolate sugar scrub would be the perfect holiday gift for friends. It sounds like the perfect gift. Thanks Julia! It was an amazing experience, and I can’t wait to gift this scrub to my BFFs! What a FUN and fantastic experience! I’ve never made my own body scrub but I want to try this!! Thanks Taylor! The scrub is so easy! Thanks Naomi! It was so fun! What a great trip. Looks like you had a lot of fun. The guide and tips are so helpful! 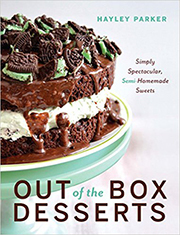 Wow – so many fabulous chocolate desserts. I think I need to book a cruise just so I can get that massage.